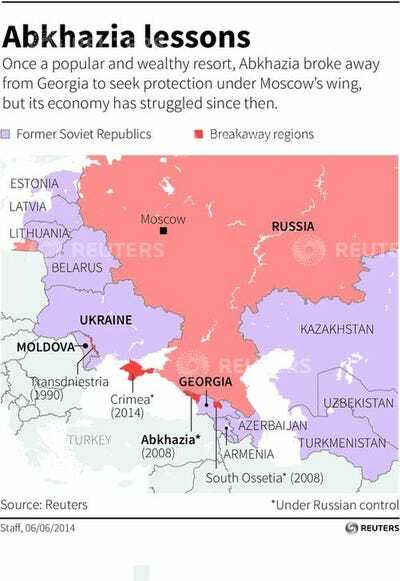 ReutersEditor’s Note: Russia annexed Crimea in March 2014. MOSCOW (AP) — Russia tightened its control Monday over Georgia’s breakaway province of Abkhazia with a new treaty envisaging closer military and economic ties with the lush sliver of land along the Black Sea. The move drew outrage and cries of “annexation” in Georgia and sent a chill through those in Abkhazia who fear that wealthy Russians will snap up their precious coastline. It also raised further suspicions in the West about Russian President Vladimir Putin’s territorial aspirations after his annexation of Ukraine’s Black Sea peninsula of Crimea in March. Under the treaty signed by Putin and Abkhazia’s leader in the nearby Black Sea resort of Sochi, Russian and Abkhazian forces in the territory will turn into a joint force led by a Russian commander. Putin said Moscow will also double its subsidies to Abkhazia to about 9.3 billion rubles (over $US200 million) next year. “I’m sure that cooperation, unity and strategic partnership between Russia and Abkhazia will continue to strengthen,” he said. “Ties with Russia offer us full security guarantees and broad opportunities for socio-economic development,” Abkhazian President Raul Khadzhimba said. Russian troops have been deployed in Abkhazia for more than two decades since the region of 240,000 people broke away from Georgia in a separatist war in the early 1990s. Still, Monday’s agreement reflected a clear attempt by Moscow to further expand its presence and came only after a change of leadership in the territory. Coming amid a chill in Russia-West ties over the Ukrainian crisis, the deal raised concern about Moscow’s plans. The Black Sea region has always been important for Putin, who justified the annexation of Crimea by saying it would guarantee that NATO warships would never be welcome on the peninsula, the home base of the Russian Black Sea Fleet. NATO’s secretary-general condemned the treaty, stressing that the alliance supports Georgia’s sovereignty. He also called on Russia to reverse its recognition of Abkhazia and South Ossetia, another breakaway province, as independent states. The U.S. also said it wouldn’t recognise Russia’s move and expressed continued support for Georgia’s sovereignty. “The United States will not recognise the legitimacy of any so-called ‘treaty’ between Georgia’s Abkhazia region and the Russian Federation,” the U.S. State Department said in a statement. Abkhazia’s former leader, Alexander Ankvab, was forced to step down earlier this year under pressure from protesters who reportedly were encouraged by the Kremlin. Khadzhimba, a former Soviet KGB officer, was elected president in an early vote in August that Georgia rejected as illegal.Unlike Ankvab, who had resisted Moscow’s push to let Russians buy assets in Abkhazia, Khadzhimba has appeared more eager to listen to Russia’s demands. 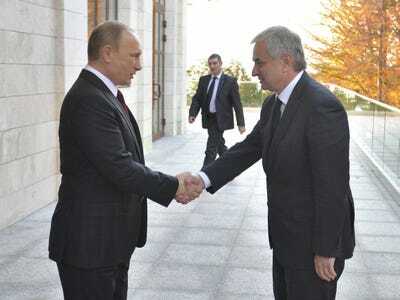 ReutersRussian President Vladimir Putin (R) shakes hands with Abkhazia’s President Raul Khadzhimba during a signing ceremony at the Bocharov Ruchei state residence in Sochi November 24, 2014. The Georgian Foreign Ministry denounced the new agreement as a “step toward the de-facto annexation” of Abkhazia and called on the international community to condemn the move. Russian-Georgian relations were ruptured by war in August 2008 after former Georgian President Mikhail Saakashvili attempted to restore control over South Ossetia. The Russian military routed the Georgian forces in five days and Moscow recognised both rebel provinces as independent states. The Georgian Dream bloc led by Russia-friendly billionaire Bidzina Ivanishvili, which unseated Saakashvili’s party in the 2012 vote, has sought to repair ties with Moscow. But while economic relations have improved, political ties have remained frozen because of Moscow’s refusal to compromise on the status of Georgia’s separatist regions. Saakashvili’s United National Movement party has accused the Georgian government of kowtowing to Moscow. “The Georgian government has done practically nothing,” said party leader David Bakradze, who urged the government to join Western sanctions against Russia and opt out of political talks with Moscow. The deal with Abkhazia appears to reflect Moscow’s concerns that Saakashvili’s party could mount a political comeback and push for stronger ties with the West. Lynn Berry in Moscow and Misha Dzhindzhikhashvili in Tbilisi, Georgia contributed to this report.